If the original grain still exists, then preferably I would have you send them in as is condition, as this may permit me to match the background or base tone to the exact original as they sometimes vary just a shade or so. Beyond that is absolutely not an issue as I have all of the original factory plates and formulas for every manufacturer that utilized the Woodgrain process. My restoration process includes stripping via glass beading all dash, garnish moldings, ashtrays, etc. to the original bare base metal. Prep that metal, sand, then all metal on all sides is primed using the absolute highest quality Dupont epoxy primers. Then applying three coats of Dupont high build primers, hand blocked and sanding all parts to prepare for the base color. Then all parts are painted three coats of the correct Dupont base color (background color). Then I use the original factory process (I have all of the original factory plates and paint/ink formulas) and carefully apply the correct Woodgrain to assure absolute correctness of detail using true quality printer’s inks. 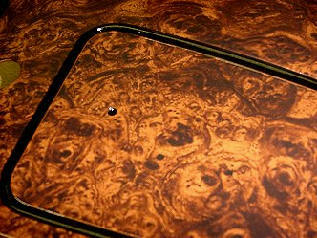 This entire process uses the newer technologies via better quality Dupont epoxy primers, converters to assist in better adhesion of the inks, and three coats of Dupont urethane clear finishes wet sanded through 3000 grit and buffed to a show quality shine to complete a fifteen step restoration process to an absolute show quality finish. Time frame to complete your Woodgraining restoration is usually four to five weeks or less but, may be adjusted depending on existing workload in the shop at the time of your inquiry and delivery of your parts at the shop here in New Boston. Please confirm! Any metal repair work (if needed) including tig welding, metal palnishing etc.will be restored at $68/hr. I would be very pleased to assist you in restoring your Woodgrained dash and or parts to absolute correctness of detail and show quality. 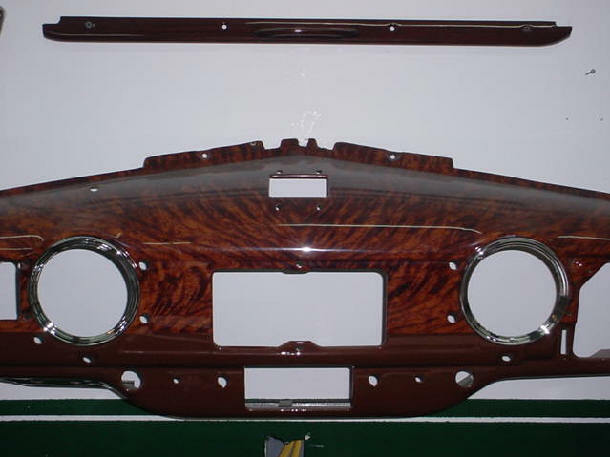 We also have restored many muscle car and custom dash plates, consoles and steering wheel inserts as many of our customers prefer the higher quality of our Woodgrain process as opposed to the old dynoc method that may have a tendency to peel, shrink or not fit properly edge to edge. Pin striping if required on these parts is done here at the shop. I will be happy to provide you a quote that includes restoration of your Wood-grained parts including return insured shipping and time frame confirmation upon request. If you have a custom part or late model part that you would like to have Wood-grained, please if possible, provide a brief description and email a picture or two. That will assist me in providing you an accurate estimate and time frame to complete.